I would like to thank you for the excellent service and quality of workmanship that Scapes and Stones provided for my customer and me on an underground electrical feed. You did an excellent job of removing a section of brick walkway and putting the brick back is such a way as to not even recognize the work had been done. Thank you for our beautiful front yard. Your team did an awesome job. We love coming home now!!! Scapes and Stone Landscape is a "Top Notch Company". From the initial appointment to the design and finished product, I got exactly what I wanted and stayed within my budget. The job was finished on time and the employees were great, very professional and respectful. I would highly recommend this company to anyone looking for more than just the average landscape job. They are able to do it all! I don't usually refer companies to friends or family as it always comes back to haunt you. For the first time in 25 years that I can remember referred Scapes and Stones Landscape Operations Manager Chad Bennett and his crews. I have no regrets! They take care of you! Quality no matter the price! My project was a small simple project but using Scapes and Stones was the best choice I made. They treated it as if they were building a piano!! Quality and treated me like I was spending a fortune. Customer Service was top notch. Owners Direct Cell Phone ALWAYS ON!!! From start to finish I could call Chad and he would either answer or return my call within a couple hours. His phone is always on and always ready to answer the call. Not too many companies in this valley you deal directly with the Operations Manager. Not to mention his Superintendent was very polite clean and treated my property with respect. I have dealt with other companies in the past and you are lucky to see a foreman! Take advantage of Scapes and Stones, you wont regret it! Your company was fantastic to deal with! The craftsmanship and detail of the flagstone patio is outstanding, and the workers were on time, diligent, respectful and completed the job (including cleanup) well within the contracted timeframe. We look forward to using your company for addition projects and would definitely recommend you and your company to others. Thank you for an excellent experience! I want to sincerely thank you for your time and effort in designing our back yard and working with us on various changes. You were professional and informative, and we were pleased with your design and your consideration for our priorities and our budget. recently had Sean with Scapes and Stones come to my residence and give us an estimate for landscaping in the front and backyard. His estimate was lower than three other estimates that I received. We contacted him the following day in which we met. Scapes and Stones started out project the next day and completed it on the day promised. Everything was exactly what we could have wished for. I personally will recommend him and his company to any and all of my friends. Stones. He called back within 24 hours, set up an appointment, and we were ready to go within his "quoted" time frame. They gave us exactly what we wanted for the price range we were looking for! We couldn't have asked for more efficiency or cooperation. They were fabulous! Called Sean at Scapes & Stones Sean gave us a written quote and met all the expectations of service in fact when finished it was less then what he quoted! Sean made our backyard a reality we are so pleased with the backyard the tweaks Sean made to our drawings shows why you should hire a professional landscaper! The landscapers Antonio and his crew were always on time and worked so quickly in the heat to complete the backyard. 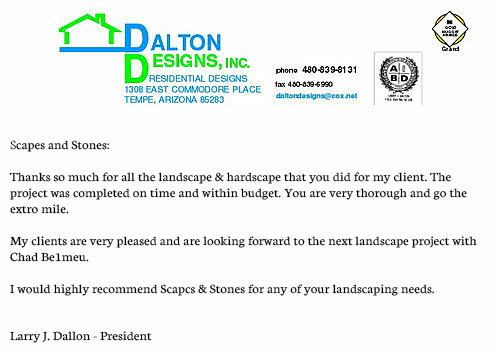 We are very pleased that we selected Scapes & Stones to complete our Backyard Dream its instant gratification! I called Sean at Scapes and Stones on Mon. Morning, and he was there Mon. Afternoon. He kept every promise including: appointments, estimates, timing, and satisfaction. His crew was also great. It was the best experience. My frontyard was in desperate redo need. Sean & his crew did an amazing job. No 2nd thoughts -hire. Scapes & Stones would like to thank those who have provided us feedback on your completed projects. If you would like your comments added to our website please visit the contact page. You can send us an email or a fax.